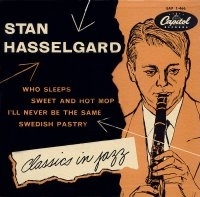 Stan Hasselgard was about to bring the clarinet into the be-bop realm when he was killed in a car crash in Illinois late 1948, only 26 years old. He had finished a two-week job with his idol Benny Goodman, who for this time only allowed another clarinet player to share the stage and, reluctantly, the solo space. After that he led his own band at the Three Deuces on 52nd Street in New York with Max Roach. His last gig was a V-disc recording for the armed forces. Five days later he was on his way back to California when the driver, his new-found love June Eckstine, the (ex) wife of Billy Eckstine, fell asleep and smashed the car. He only spent 17 months in the US, arriving from Sweden in the summer of 1947, just weeks after finishing his university studies with a Bachelor of Arts. The official reason, that made his family pay for the trip, was to study at an American university. But his real drive was to hear Benny Goodman live. He soon continued to California, "where the best music is to be heard. Both Goodman and Tommy Dorsey are playing there", he wrote in a letter. Note: These texts are largely based on the liner notes and articles written by Sweden's foremost expert on Hasselgard, the owner of Dragon Records, mr Lars Westin. His label is also the major source for Hasselgard reissues, so far with four LPs and four CDs. "California Sessions" is just released. Expect more to come! Thanks also to mr Anders R. Öhman, the owner of Phontastic Records and a clarinet player of his own, who offers a rare testimony of hearing Hasselgard in 1945. 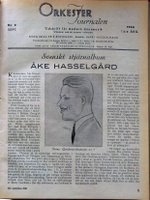 Other sources are Hasselgard's own writings in the Swedish jazz magazine OJ and the personal recollections of the late pianist and story teller Thore Swanerud, who played and arranged with Hasselgard 1946 to 1947. Tomas Classon, grandchild of drummer Nevado Classon, confirmed my note to the first two sessions in the discography. A rich source is also Jonas Sima’s movie The Åke Hasselgård Story, where Lars Westin conducts interviews with, among others, Benny Goodman, Uan Rasey and Bob Redcross. Finally, I'll never forget Jörgen Haag, the clarinet player from my home town that gave me my first Hasselgard 78 and who could play Stan's solos by heart. A warm heart that was. Två sidor med Johnny Whites kvartett är helt nya liksom fyra från Jubilee - men för den som inte har gamla LP från Dragon (DRLP 29) och Cupol är allt nytt och värt att glädjas åt. Till höger Capitolomslaget med teckning av David Stone Martin.